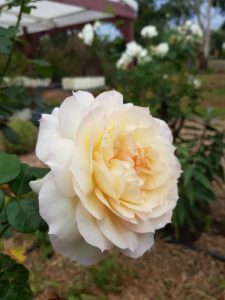 Hello dear rose friends as we bask in the glory of autumn and our rose garden looks its most majestic best and we enjoy planting a new area of garden with all the potted roses we ‘snavelled’ from stock throughout this past season! 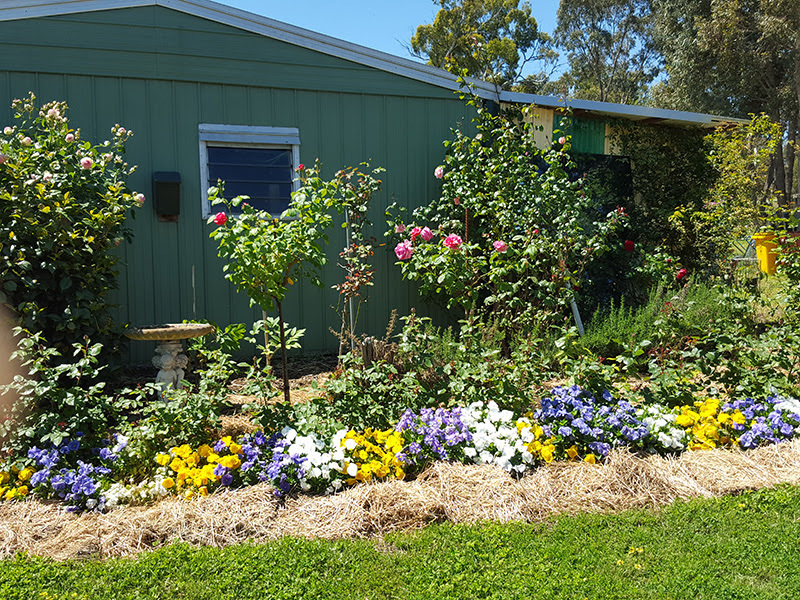 I haven’t been able to help myself – madly planting lots of kale and silver beet, the pansy border is done and I’ll definitely get the team to assist with planting more roses in MY GARDEN BED! The last few bulbs will go in this week too and I expect a truly magnificent display coming spring. Q. What do you call a cow with no legs? A. Ground beef! 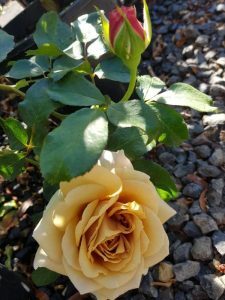 We all have a different style and approach to gardening – mine is random and without order, Diana is orderly and tidy – she weeds and mulches in timely fashion and usually according to moon phases so HER gardens usually look neat and well-tended. Neither of us ‘over think’ colour blending because we know from experience that all the colours work together … I guess we complement each other in our different styles of gardening yet we definitely appreciate OUR OWN GARDEN while we work the entire property very much as a team! Q. Why did the Math book look so sad? A. Because it had so many problems! 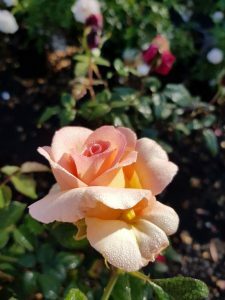 If you need a hand with selecting rose varieties or planning a rose garden this winter, please don’t hesitate to send your wish-list and some pictures, perhaps a rough mud-map with dimensions so that we can assist you to plant the rose garden of your dreams! 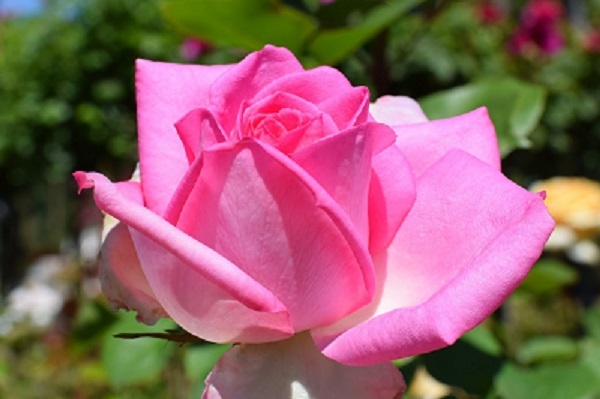 Be sure to plant some more roses in your garden during this most ideal season for rose planting! 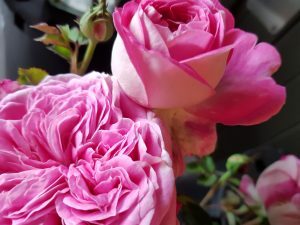 People often ask us which rose is our favourite – both of us genuinely love roses for their enduring beauty, continual flowering, amazing fragrances and simply because they afford us such enormous pleasure in our gardens! We each have lots of favourites … you’re welcome to share your favourite with us and other RR subscribers – send a pic! Just for an extra giggle to overlook the RR mess last week: Q. What did Mozart get when he ate baked beans? A. Classical gas! 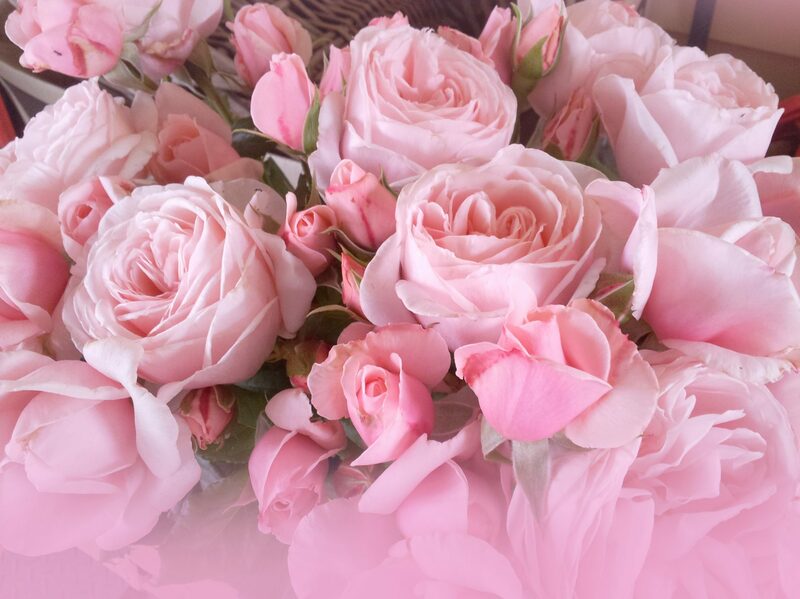 Hello dear rose friends as we now recover from a very busy time! 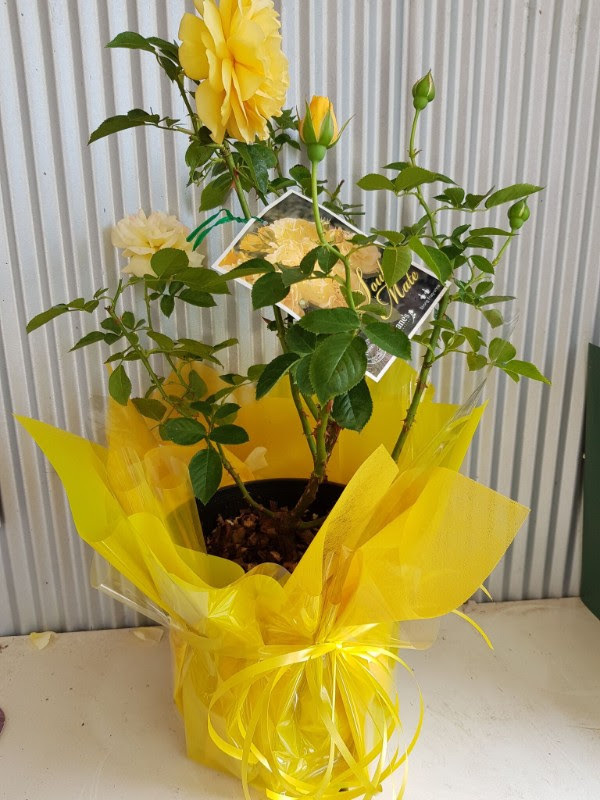 Unfortunately, the weather this past weekend was woeful and it surprised us enormously that so many of you ventured to Silvan for the Tesselaar Plant Expo – it was so cold and the wind blew unmercifully so management there decided we should set our magnificent vases of roses in a dark but sheltered walkway with just one spotlight! Diana and her friend Marilyn did an amazing job with our magnificent display of roses in vases despite the howling wind and icy rain! We enjoyed the weekend together with delightful breakfast at Sassafras Bakery, dinner at The Cuckoo and hanging out at a lovely B&B – thanks to Ben, Leigh and Tova for manning the Rose Farm! However I have just received my BBG Committee email and it was noted that I had to contact you re the Art and Flower (March) Show. But it was too late when the subject was addressed and consequently that date was already filled. But hoping that you will be staging another one next year we will be delighted to attend that one. Would appreciate the date and details for the next one so that we can plan for it in the next 2019 calendar. It was very opportune for me that the huge marquee provided refuge from inclement weather so lots of gardeners attended my presentation so they will now manage their roses with greater knowledge, use our organic rose management program and enjoy pruning their roses with confidence this winter! Q. What do you call a cow that eats your grass? A. A lawn mooer! Diana and her friend Marilyn did an amazing job with our magnificent display of roses in vases despite the howling wind and icy rain! 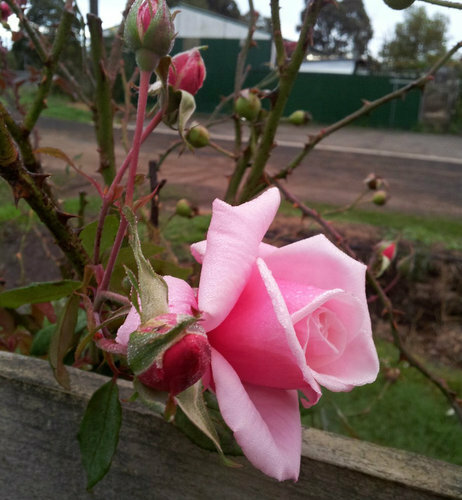 We enjoyed the weekend together with delightful breakfast at Sassafras Bakery, dinner at The Cuckoo and hanging out at a lovely B&B – thanks to Ben, Leigh and Tova for manning the Rose Farm!atHealesville . Was tempted to go back on Sunday but believe the weather was much the same. 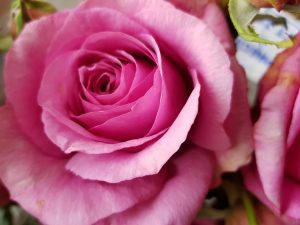 EMAIL: Subject: Can you identify this Rose? On this occasion, we probably got it right – PAPA MEILLAND. 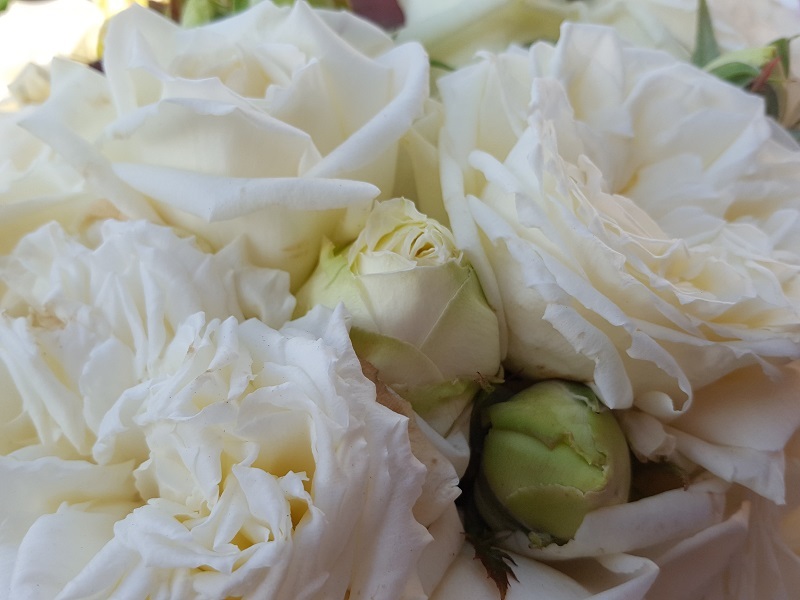 However, if you have a rose you would like to know the name of, please, send us as much information as you can – along with pictures of course. Close up is great, foliage is important and any information you provide will assist! Q. What do you call a pony with a cough? A. A little hoarse! It’s now very spectacular here in the gardens with the autumn trees putting on their most spectacular display so if it’s sunny any Friday – Monday soon, do jump in the car and come for a visit. Remember, you are ALWAYS WELCOME to walk around the gardens when you come here! Q. Why can’t you borrow money from a leprechaun? A. Because he’s always a little short! If you’re going to completely re-pot, why not just use the same pots? You’ll bare-root the roses, trim the roots and the tops and then plant them back into the same pots I would think??? However, if you want to get larger pots, you might increase the size by at least 20cms I guess ??? Ofcourse you CAN grow a weeper in a pot but I would only recommend such a situation if you were using the weeper to cover say, a pergola / veranda / or some other structure that the understock cane of the weeper can be well supported by such a structure. 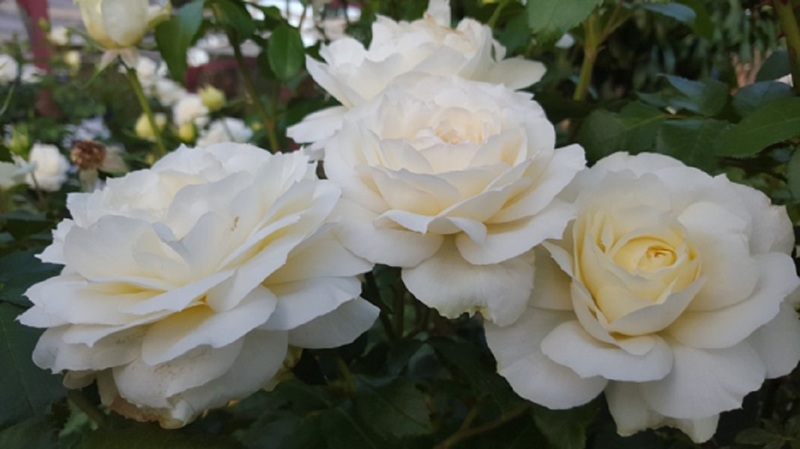 Remember, a weeping rose could easily grow a ‘head’ which is up to 2 metres diameter so unless you have a pot which is 2 metres in diameter, the head will require substantial support! Hi Kim … Pots work well provided you water them adequately … since you’ve been so successful, I guess there might be just a bit of an issue with those two varieties? 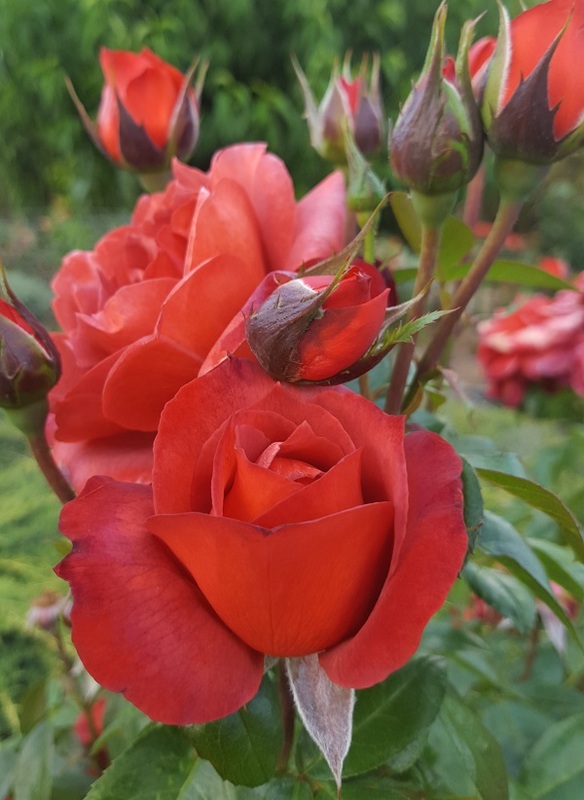 If a rose doesn’t perform, take a look OUTSIDE THE SQUARE … is it the rose at the end of the row – on the high side (it might be dry or maybe getting more shade than it likes), perhaps the lowest point (is it too wet or not getting adequate air circulation)? 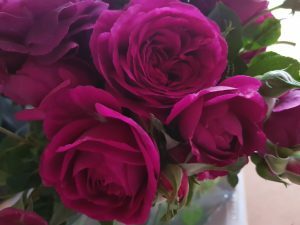 When roses are being kept in pots I suggest you use QUALITY POTTING MIX and don’t muck with it by adding bits and pieces … always pour ECO-SEAWEED over the entire plant at least once a fortnight and feed regularly once the rose has foliage. The bigger the pot, the bigger the plant! For roses especially, more roots and foliage, MORE FLOWERS! My response Hi Judy .. I would think that your entire rose garden would be ‘seaweeded’ with oooh, 5 watering cans??? 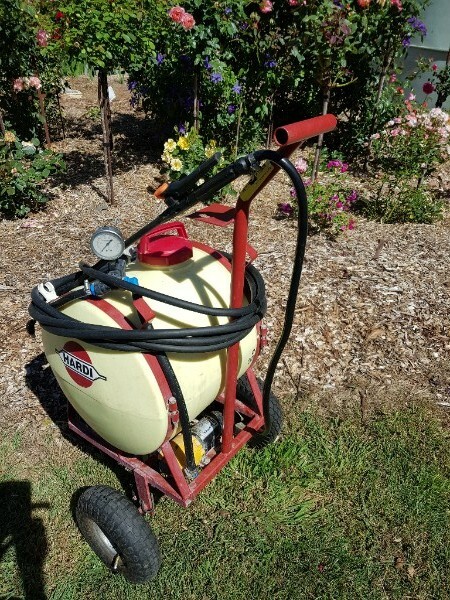 It’s a sprinkling over the roses and yes, as the bushes grow it might be exhausting with watering cans but then load up a spray unit … there are lots of small garden units available so you can get 25 – 50litres of spray distributed very economically .. worth investing in a unit similar to what we use at the Rose Farm! Q. What did one candle say to the other candle? A. Are you going out tonight? 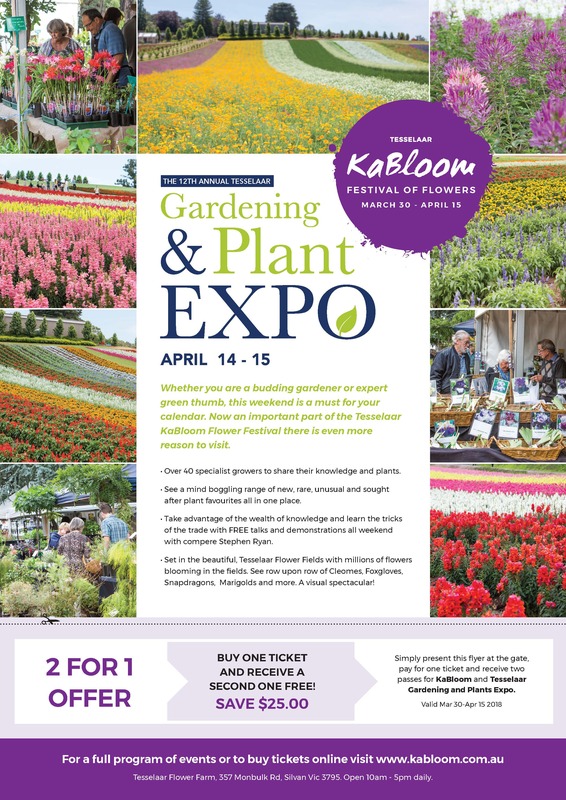 This weekend we are exhibiting at this magnificent destination so do come along and see and smell our awesome display of field-grown roses – lots of new-release varieties – over 40 vases of fragrant roses will be displayed! Graham will be doing a presentation on stage at 10.30am on SATURDAY MORNING. Hope we catch up with you at one of these destinations this weekend – cheers from Graham, Diana, Mooi, Tova, Ben and Leigh – this weekend we’ve got our friend Marilyn helping us as well! 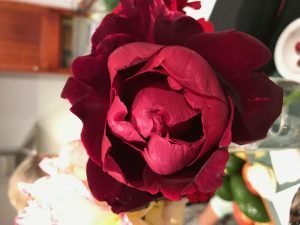 “Hi Diana, I bought a fragrant dark red climbing rose from you called DON JUAN. It is probably in too exposed a position to have grown to its best potential, but it is slowly filling a wire obelisk I gave it for support. I didn’t realise it was a climber when I bought it and I would have chosen a different location if I had noticed it was a climber on the tag before I planted it, but I didn’t want to move it once it was in. 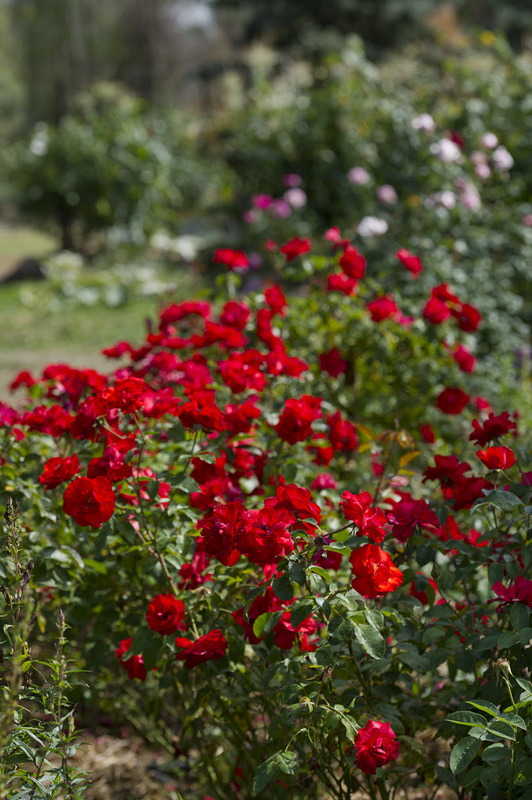 It is on the end of a row of red roses. MY RESPONSE: “Hi Sarah … how lovely to read this email … you know, DON JUAN is still one of Graham’s most favourite CLIMBING RED roses and I’m almost 100% sure that he sent budwoodso that we will have DON JUAN plants later this winter … confirming: WE WILL HAVE 20 plants available in July this year and you MUST CALL THE NURSERY on 03 5787 1123 if you wish to order! 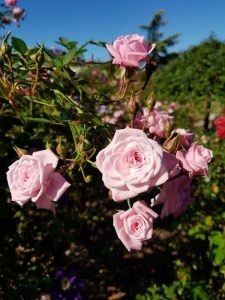 Yes, it is a climber … sometimes, when a rose is ONLY grown as a climber, we name the rose exactly as is … for example, DON JUAN – RENAE – CREPUSCULE – ALTISSIMO – lots more climbing roses which are ONLY CLIMBING ROSES! 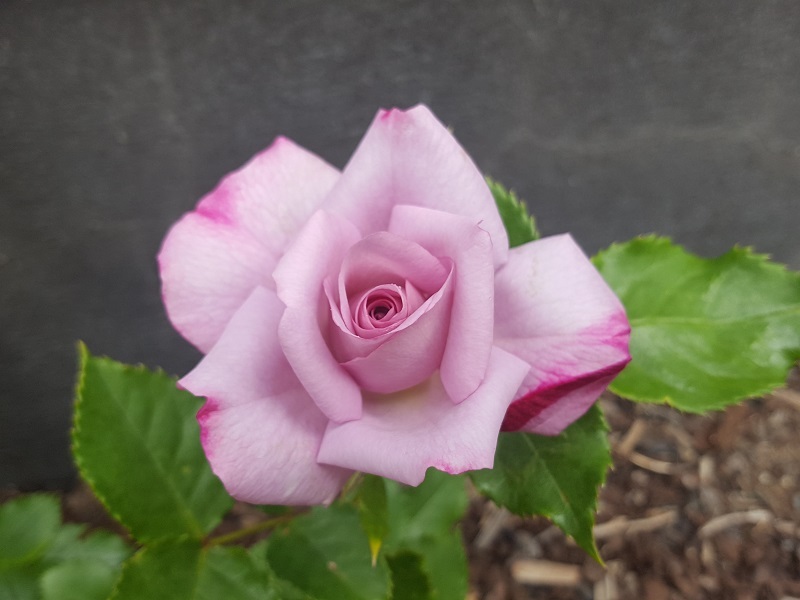 When a rose such as BLUE MOON orICEBERG (and lots of others) have a CLIMBING derivative (called a ‘sport’ usually) then we refer to the rose by its name and add the word CLIMBING on the plant tag. BLOSSOMTIME: what a gorgeous spice and apple fragrance! 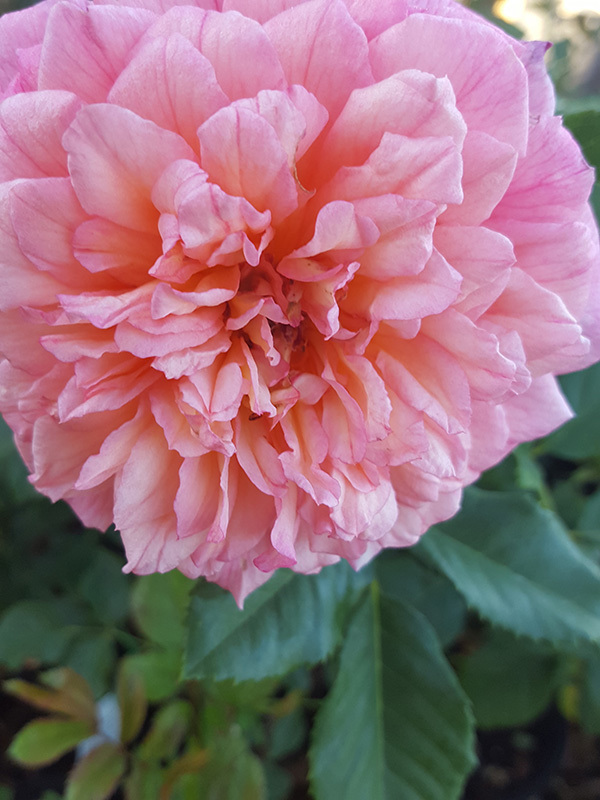 Perfectly formed mid-pink inner petals with dark pink shades outside make this such a particularly pretty specimen rose suitable for a vase and definitely a strikingly healthy specimen to scramble over a 2 x 2 metre lattice or fence … highly recommended climbing rose! Pause for a joke: Q. Why did the man run around his bed? A. Because he was trying to catch up on his sleep! 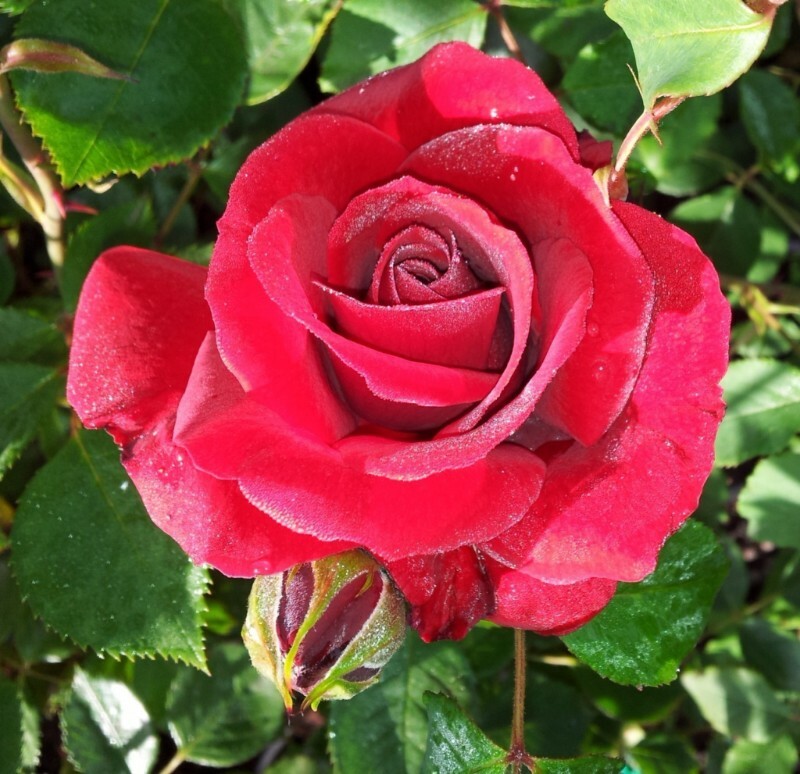 DUBLIN BAY: is one of the very BEST pillar-box-red climbing roses … always in flower, always healthy and neatly fits in a fan shape against even the most hot location; a brilliant climbing/pillar rose which, for me, exudes a subtle but distinct rose fragrance. 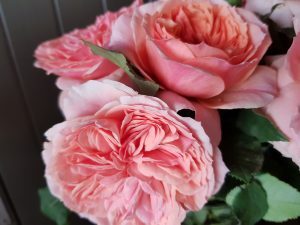 ALOHA: such a unique colour and flower shape – I cannot get over how truly lovely this rose is and it is destined to be planted in a very prominent location in our gardens this autumn – I simply love this rose and highly recommend it for a climber in your garden! Q. Can a kangaroo jump higher than the Empire State Building? A. Of course! The Empire State Building can’t jump!!! 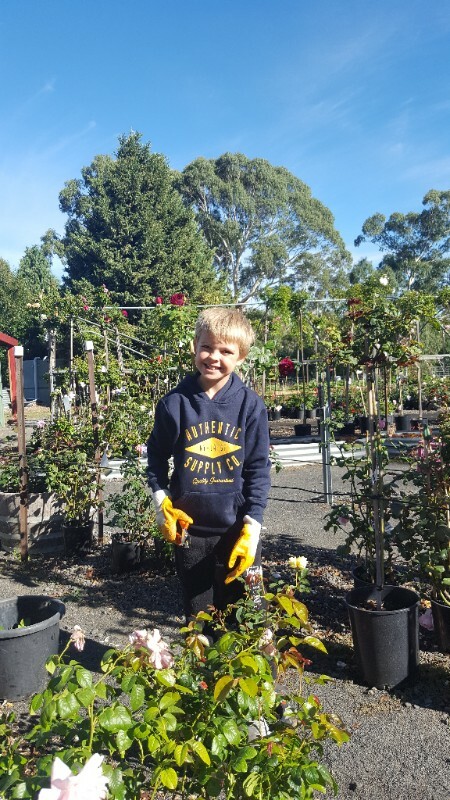 Remember, children and grandchildren are watching you when you garden – that’s how they learn about Mother Nature so take them into the garden with you! 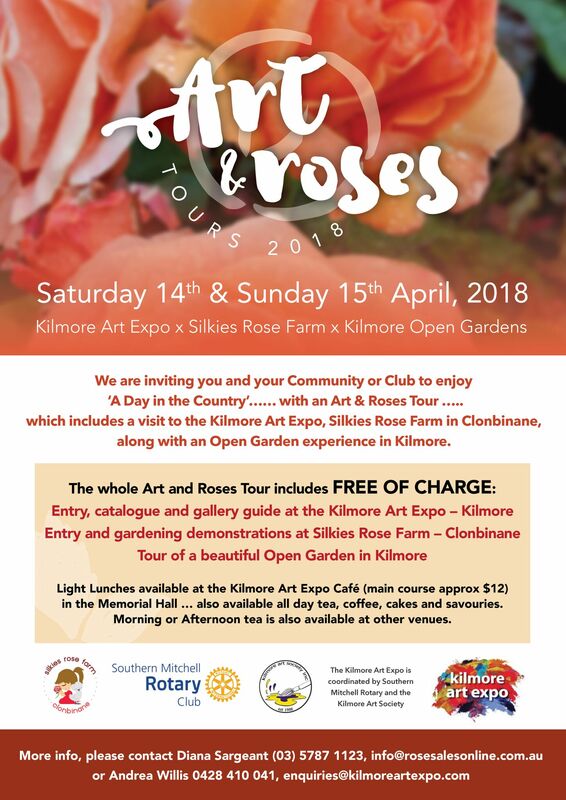 If you’re in Sydney this weekend, pop into the Galston Community Centre on Sunday, 8th April and visit with me, Diana at the Upper North Shore Rose Show – I would LOVE to see lots of our customers and friends at this inaugural rose show.